Nobody wants to break down or be stranded, but it happens. Instead of panicking, call Barnett’s Towing. 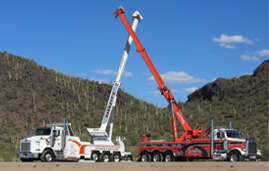 We have the biggest fleet in Arizona and cover nearly all of Central and Southern Arizona, so you won’t be stuck waiting hours for a tow truck to come help you. We can tow cars, trucks, SUVs, motorcycles, exotic cars- even tractor trailers. Give us a call when you need a helping hand.